Ammonia and hydrogen peroxide are common ingredients for permanent hair coloring, but not strictly necessary for dark colors and shades. Bigen? proprietary system colors hair dark, simply, for a healthier look, shine and beauty. WATER-ACTIVATED Once mixed with water, Bigen is ready for use. Water naturally and gently opens the cuticles so that Bigen? tiny color pigments can penetrate deeply into the hair shafts. Once your hair dries, the cuticles naturally close and retain the new color. 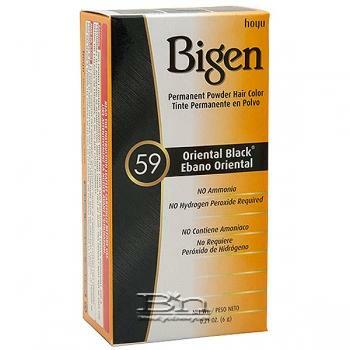 PERM / RELAX & COLOR THE SAME DAY Bigen can be used on medium to coarse hair the same day of hair relaxing or perming. 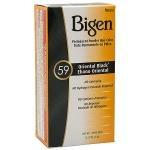 With minimal damage to your hair, Bigen? colorants maintain stability and last longer. Harsh dyes that damage your hair won? hold color as effectively because they open your cuticles excessively to accept the colorants, and they may not properly close after coloring. When this occurs, the colorants easily fade out.